In the first four months of 2015, the private investment in fixed assets reached 7,835.5 billion yuan, a year-on-year increase of 12.7 percent in nominal terms, 0.9 percentage points lower than that in the first three months. 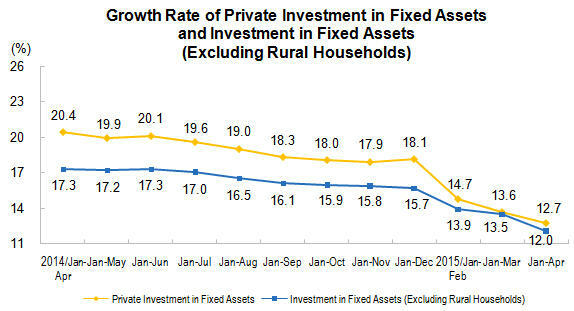 The proportion of private investment in fixed assets to the total investment in fixed assets (excluding rural households) was 65.3 percent, 0.3 percentage points higher over the same period of last year. In term of different areas, the private investment in fixed assets in eastern region amounted to 4,052.5 billion yuan, rose by 12.8 percent year-on-year, decreased 0.8 percentage points over the first three months; that of central region, 2,338.1 billion yuan, surged 16.9 percent, an increase of 0.2 percentage points; that of western region, 1,444.9 billion yuan, increased 6.2 percent, down by 3.2 percentage points. In term of different industries, the private investment in fixed assets in primary industry reached 226.4 billion yuan, a year-on-year increase of 33.7 percent, decreased 4.2 percentage points over the first three months; that in the secondary industry amounted to 3,891.2 billion yuan, increased 11.6 percent, down by 0.6 percentage points; that in the tertiary industry was 3,717.9 billion yuan, went up by 12.7 percent, decreased 1.4 percentage points. Of the secondary industry, industrial private investment in fixed assets reached 3,858.9 billion yuan, a year-on-year increase of 11.7 percent, decreased 0.4 percentage point over the first three months, of which, that of mining industry was 131.6 billion yuan, decreased 9.6 percent, and the pace of decline remained at the same level; that of the manufacturing industry was 3,545.3 billion yuan, increased 11.6 percent, decreased 0.4 percentage points; that of the production and supply of electric power, heat power, gas and water was 182.1 billion yuan, increased 36.3 percent, dropped by 0.3 percentage points. The growth rate of private investment in fixed assets is nominal growth rate, because the price indices of investment in fixed assets are calculated on quarterly basis, except Jan.-Mar., Jan.-Jun., Jan-Sep. and Jan.-Dec., the growth rates in the other months are nominal growth rates.